World's Oldest Petrified Sperm Found - and It's Huge! 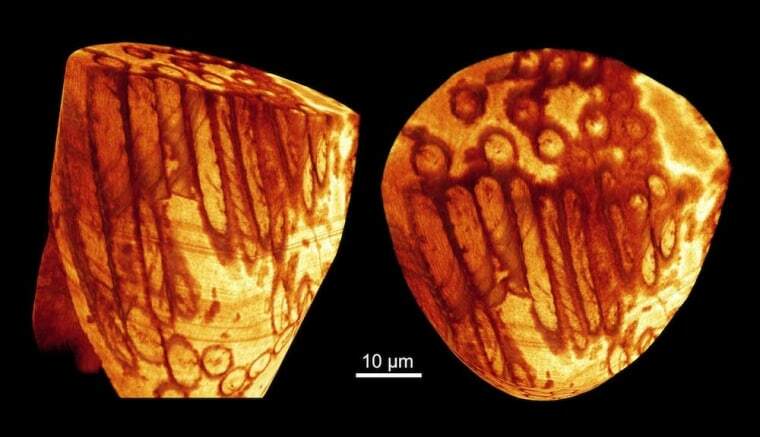 The oldest petrified sperm ever discovered is gargantuan, at least for a gamete. The sperm comes from the early Miocene epoch, between about 23 million and 16 million years ago, and belonged to a tiny crustacean called a seed shrimp or ostracod. Seed shrimp are bivalves like muscles, but sport tiny appendages that make them look like walking beans. Though they measure just millimeters long, their sperm often reaches more than 0.4 inches (1 centimeter) in length. The new fossilized sperm comes from an ancient cave deposit in Australia, where bat guano falling into the water may have helped preserve the cells. Seed shrimp aren't the only organisms with absurdly long sperm. The longest sperm in nature today belongs to Drosophila bifurca, a fruit fly whose seed stretches to more than 2 inches (5 centimeters). But ostracod sperm is extra odd, because it lacks the familiar tail, or flagellum, that propels most sperm cells. Instead, ostracod sperm consists of a large, elongate head. This entire structures moves by contracting organelles along its membrane, which causes the sperm cell to ripple and rotate. Matzke-Karasz and her colleagues discovered the fossilized sperm cells in five specimens of ostracods from the Riversleigh fossil site in northwest Queensland, Australia. This site preserves what was once a cave, with copious ancient bat bones and cave formations. Ostracods once lived in standing water inside the cave. The sperm are at least 16 million years old and fossilized in rock, making them the oldest petrified sperm cells ever discovered. (The previous oldest-known ostracod sperm was only a few thousand years old.) One other sperm find does beat out the ostracod find in age: An insect-like springtail trapped in amber about 40 million years ago had sperm inside its body. But preservation in amber is different than preservation in rock, as amber frequently preserves soft tissue and rock rarely does. The findings were reportedtoday (May 13) in the journal Proceedings of the Royal Society B: Biological Sciences. This is a condensed version of a report from Live Science. Read the full report. Follow Stephanie Pappas on Twitter and Google+. Follow us @livescience, Facebook & Google+.